Lost Colony, the debut feature from writer-director Christopher Holmes (previously known for the shorts Sapsucker, Arrowhead and Fence Dogs) is a deceptively simple film. 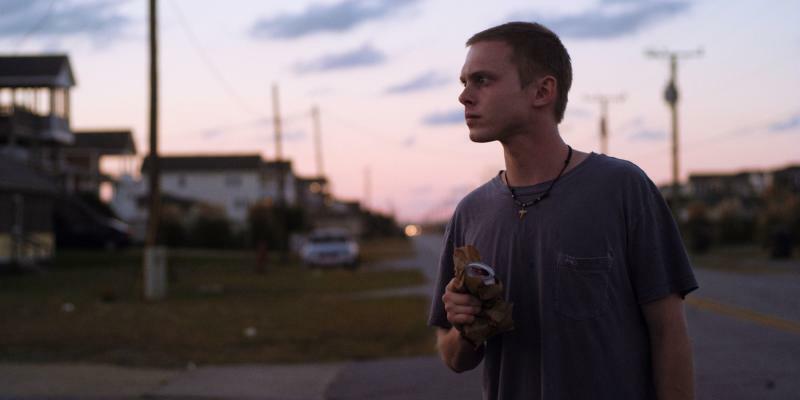 Set in the Outer Banks of North Carolina, not far from the site of the “Lost Colony” of Roanoke, the movie at first appears to be a relatively ordinary coming-of-age story. Soon, however, it reveals itself to be a complex narrative exploring issues of memory, identity and self-determination in a hauntingly stark (yet beautiful) landscape of physical and mental decay. Abandoned and rotting structures – our own modern “lost colony” – litter the periphery, mirroring the internal struggles of the characters to overcome the hand that fate has dealt them. At the center of the drama lies Loren (Joshua Brady, The Ultimate Life), a waif of a young man who announces, in opening narration, that his father, years ago, was eaten by a shark. Something dangerous lurks in the currents off and of this land, always ready to pull us under. Somehow this boy is now on the cusp of fatherhood, himself. Barely 18, he and his girlfriend, Ramona (Sam Buchanan, The Last Time You Had Fun) are expecting a child, though Loren seems the more enthusiastic prospective parent of the two. He still lives with his mother, Patricia (Stephanie Renee Morgan, One Last Sunset Redux), who alternates between homilies and scolds, and may be keeping a secret from him. Loren also pals around with an older cousin, Randy (Phillip Ward, Hellphone), who is both friend (his only) and surrogate father. The cast is top notch – I especially liked Morgan and Ward – though Brady looks almost too young, even for 18. It’s hard to imagine the worldlier Buchanan letting him romance her. Then again, there’s no one else in this town. Throughout, Holmes weaves in leitmotifs of parenthood and responsibility, and how they relate to our place in a world beset by chaos. Patricia listens to Rush Limbaugh on her car radio, and his shrill drone about who is to blame for the problems of today (always “them,” never us) is the underlying soundtrack of the universe from which Loren needs to escape to become a man. It’s a dreary place, but not without its appeal, especially as photographed by Christopher Schneider (The Volunteer), who brings a lush touch to the barren surroundings. Obliquely poetic, with dreamy voiceover and the occasional cutaways, à la Terrence Malick, to close-ups of objects, food and nature, Lost Colony may frustrate viewers looking for a more traditional three-act structure, but I would urge them to weather the course, as there are deep riches in these waters, sharks notwithstanding.